One of the first textbooks in this emerging important field of ecology. Most of ecology is about metabolism: the ways that organisms use energy and materials. The energy requirements of individuals – their metabolic rates – vary predictably with their body size and temperature. Ecological interactions are exchanges of energy and materials between organisms and their environments. 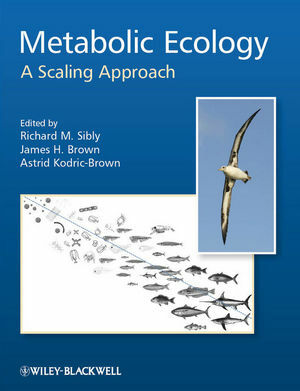 So metabolic rate affects ecological processes at all levels: individuals, populations, communities and ecosystems. Each chapter focuses on a different process, level of organization, or kind of organism. It lays a conceptual foundation and presents empirical examples. Together, the chapters provide an integrated framework that holds the promise for a unified theory of ecology. The book is intended to be accessible to upper-level undergraduate, and graduate students, but also of interest to senior scientists. Its easy-to-read chapters and clear illustrations can be used in lecture and seminar courses. Together they make for an authoritative treatment that will inspire future generations to study metabolic ecology. Richard Sibly is Professor in the School of Biological Sciences at the University of Reading where he teaches Behavioural Ecology and Population Biology. He researches metabolic ecology questions with members of Jim Brown's Lab at the University of New Mexico and also works to promote the use of Agent Based Models (ABMs) more widely in ecology. James H. Brown is Distinguished Professor of Biology at the University of New Mexico, Albuquerque. He led the development of the Metabolic Theory of Ecology on which this book is largely based. He has a long history of research in biogeography and macroecology, taking a large-scale statistical approach to questions about abundance, distribution, and diversity. Astrid Kodric-Brown is Professor of Biology at the University of New Mexico, Albuquerque. Her research interests include the behavioral ecology of freshwater fishes, especially the evolution of mate recognition systems and their role in speciation in pupfishes (Cyprinodon); the allometry of sexually-selected traits; and community structure and conservation of desert fishes.